Estée Lauder Canada’s FREE Gift With Purchase when you Spend at Least $50 on Skincare & Cosmetics! Estee Lauder Canada has a new promotion going on where you can get a free gift when you spend at least $50 on skincare and cosmetics until August 24th at 11:59pm! The best part is that you get to choose between Advanced Time Zone Age Reversing Line/ Wrinkle Creme and Resilience Life Firming/ Sculpting Eye Creme. Also, click here to sign up for emails to receive special offers sent to your inbox, new product previews, tips, trends and more! Offer expires on August 24th. 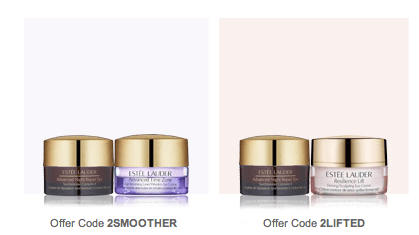 Estee Lauder also offers free standard shipping.